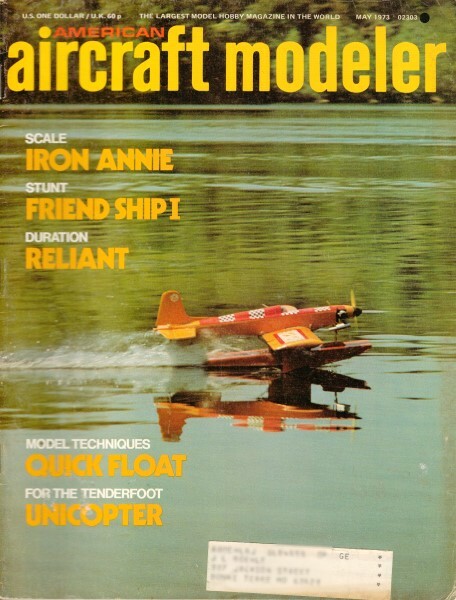 Airplanes and Rockets website visitor Jim S. wrote to request that I post the original article for the Friend Ship I full house R/C airplane from the May 1973 edition of American Aircraft Modeler. 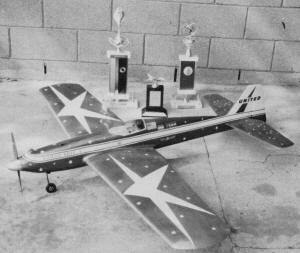 Jim says he has already built a 30" span version, but is now looking to build a balsa-framed 60" wingspan version. He must really like the Friend Ship I! The original model used Glaskin foam wings with fiberglass covering, so the plans do not show a built-up wing construction. Friend Ship I has been created as a result of a casual conversation, and a desire to build an aerobatic aircraft that looks realistic, rather than like some kind of jet with a prop on the nose. 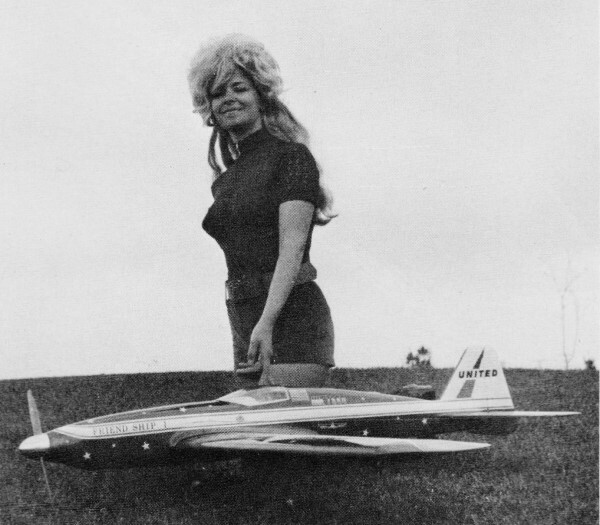 I was discussing aircraft design at the '71 Internats with Bob Smith, Chuck Smith and Terry Prather, when the feasibility of utilizing Bob's Miss B.S. for pattern was mentioned which immediately lit a fire under me. 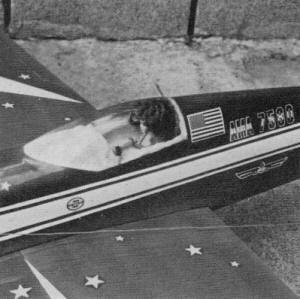 The sleek, lean, clean lines of Bob's racer make it look like it is doing 150 mph when it is sitting on the ground, and this type of model generates intense excitement in all who view it. The goals established for this design are necessarily tough, because the competition in pattern today demands perfection. Competition reliability and perfection have been built in from the outset by using only the best equipment available. Access to every vital component is provided through purely logical placement (and lack of room to put it anywhere else), ensuring precise contest trim. Aerodynamics plays an important role in providing this aircraft with the ability to achieve flying perfection. A feeling of freedom and absolutely precise control overcomes the flier as soon as she takes to the air. Total penetration ensures that windy flying is no longer a problem, and corrections during a maneuver are extremely rare. Though not difficult, this subject is designed for the experienced builder, so construction notes will be primarily restricted to features unique to this design. The Sunday flier who wants something special to take to the local field will have no trouble building Friend Ship I. Careful wood selection is a necessity. Use medium balsa for the fuselage sides, and light stock for the remainder of the plane. Pre-assembly for fuselage includes the nose section alignment jig. Successful pattern plane must be accurately built. Top blocks need hollowing before mounting. Use a template to be sure not to remove too much balsa. A Dremel tool and X-acto round-gouge blades make the work go quickly. Glaskin wings featured in this model are available from the manufacturer with retract cut-outs. 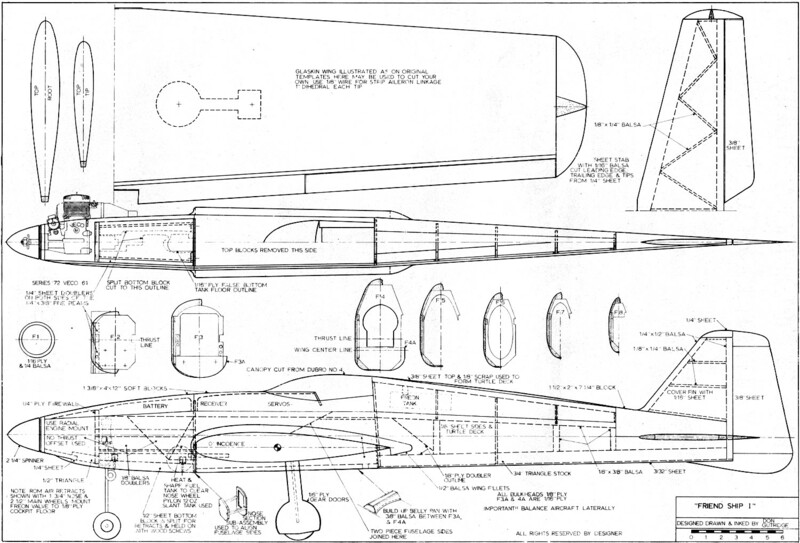 Plans show templates for making your own foam and balsa wings. Friend Ship is an impressive flying machine. It is fast and smooth even in strong winds, yet easy to fly well and win with. Fast way to dress up a cockpit is to line it with cloth and put a Barbie doll in it. Canopy is put on backward as explained in text. A unique feature is the bottom hatch for access to the nose gear which also mounts the on-off switch. 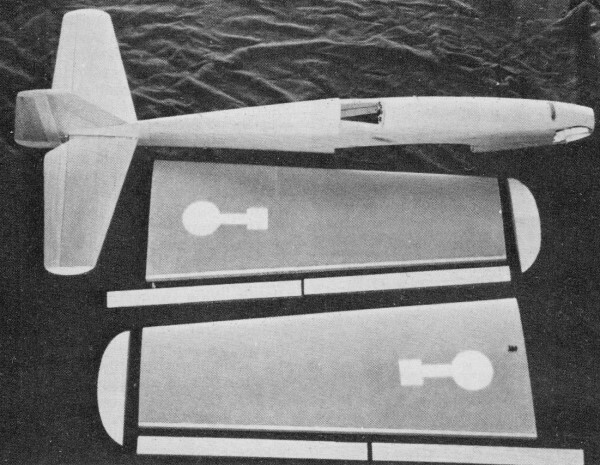 After cutting out the fuselage sides, doublers and bulkheads, splice the two-piece sides together lining them up over the plans. Make both sides identical using a sanding block. Mark bulkhead positions, thrust line, and wing and stab incidence lines before framing with doublers, longerons, and triangle pieces. Also mark centerlines on all bulkheads, and the thrust line on the firewall. Perfect alignment of the fuselage is accomplished with the nose subassembly shown on the plans. Cut the two hardwood beams (measuring from the top view), and hold F2 and F3 between them with rubber bands. Line them up using both views on the plans, and spot glue with epoxy when perfect. F4 and the subassembly are now epoxied to one side of the fuselage. Join the two sides at F2 and F3 only making sure they are parallel as viewed from the side. The sides will now come together at the tail meeting on the top view centerline together with the bulkhead centerlines. After adding the remaining fuselage formers, begin forming the turtle deck starting with the 3/8" top piece. Plane the sides even with the formers and add the decking. Now bevel the sides with the top, and add a piece of 1/8" scrap to provide room to shape it into a gentle curve. Add the freon tank support using 3/8" scrap balsa. It is now time to prepare for the real fun in building this ship. The two top blocks are fitted by notching at F2 and F3, and cutting to match up with the fuselage sides. Make two angle cuts to form the cockpit opening in the rear block, and make the final cut using the top view for reference. Hollow the blocks to the outline on the plans, but be careful not to go too far, or you may find some unexpected holes when the outside is being shaped (as I did). After adding the engine mount, push rod tubes, and blind nuts for the nose gear, add the 1/4" tank compartment doublers, install the top blocks, and fill the nose with triangles and scrap balsa where needed. Fit, but do not glue, the bottom block under the tank compartment. With the engine fitted and removed to get the nose rings in place, take your trusty razor plane in hand and let the shavings fly. When this operation is completed, and you are standing knee-deep in curly little strips of balsa, the wood remaining on your creation will truly form a thing of beauty, which is now ready to receive the tail section. Be sure your wife understands that the large piece of wood will not fit in the vacuum cleaner, or she may get carried away. The shaping of the tail section is an important part in determining the success of this model, so take care to form them into a very streamlined airfoil, and ensure a close fit at the hinge line. It is also a good idea to countersink the control horns. Apply epoxy. to the well when they are screwed in place, then fill with putty and sand smooth with the control surface. This eliminates that added-on look, and provides a neat-looking streamlined installation. If a heavier engine than the Veco 61 is used, it would be wise to make the vertical fin from hard 3/8" sheet to aid balancing. After the horizontal stab is fitted, mark the center of the vertical fin block, and pre-carve to fit the fuselage contour and the fin outline. Now epoxy the block, and the vertical stabilizer in place. The fuselage is now ready for wing fillets, but we will first need a wing. 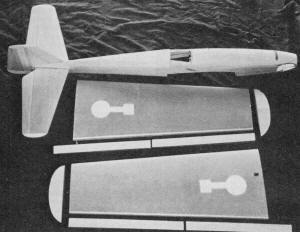 The templates on the plans may be used to cut a balsa covered foam wing. A great deal of time, and weight may be saved, however, by simply ordering a Glaskin Wing from A.R. Flight (23326 Ladrillo St., Woodland Hills, Calif. 91364). This type of wing was used on the original and is highly recommended. It is available complete with retract cut-outs for $33.95, or set up for fixed gear for $29.95. All that is required to assemble the wing is fitting the trailing edges, aileron linkage and ailerons, retract mountings, and join the halves. The vertical part of the aileron linkage is offset 5/8" to the right of the wing center, and the clevis should be connected 3/4" up from the center of the trailing edge. The main gear doors are attached to the legs of the retracts with silicone rubber after painting. Do not add the wing tips until after the wing has been fitted to the fuselage. Use 1/4" dowels to hold the front of the wing, and reinforce F3 with two small squares of 1/8" ply where they enter the forward compartment. The rear of the wing is held with camlocks, which are countersunk into the foam and braced with a 1/8" ply ring. 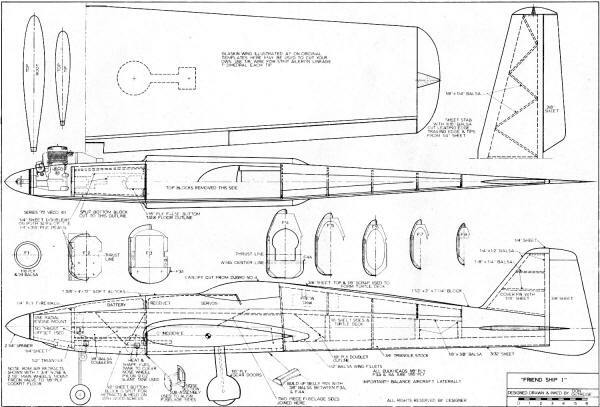 With the wing fitted, add F3a and F4a and build the pod below the wing with 3/8" scrap balsa as shown on the plans. Now install the engine and muffler, and both main landing gears (with the wheels up), and balance the aircraft laterally as you hollow and add the wing tips. This operation is vital to optimum performance, so make sure it is not overlooked. As with the tail section, be sure the wing tips are shaped to the outline on the plans. All that remains is to fit the wing fillets, and complete the detail in the tank compartment. The outline for the 1/16" ply tank floor is seen in the top view. The floor is supported with 1/8" sq. balsa rails, and is removable through the slots in F3. Split the bottom block as outlined in the top view, and drill two holes in each to accept the head of a small screw. A small square of 1/16" ply is epoxied over the holes to act as a stop for the screw heads. Cut four small blocks of hardwood for the screws to go into, and epoxy them inside the nose just above the bottom blocks. This nose assembly is extremely neat, and may be completely disassembled in a matter of moments. Before filling and final sanding, add the cockpit floor, instrument panel, and final detailing. It does not take very long to cover the dash panel, side rails, and head rest with some material from the nearby yard goods store, to add a little touch of realism. When the canopy is fitted, make sure it is cut with the pointed end facing forward. The contour of the canopy will not blend properly into the lines of the fuselage if it is fitted facing the other direction. Using tape to define the line of the frame, flair the canopy into the fuselage with micro balloons, epoxy or Epoxolite. Everyone has his own method for finishing his creations, so that will be left to the individual. My favorite method is Francis resin, and K&B Superpoxy. These products are fast and easy to work with, and the end result is always perfect. Alas- the day of truth is finally staring you in the face. Filled with anticipation of the events about to take place, the adrenal in pours rapidly through your heart as Friend Ship I taxis to the end of the runway. The engine responds instantly as the throttle lever is gently advanced to full power and rotation begins as the blur on the runway rapidly reaches take-off speed. STOP! There is something else you should know first. Prepare yourself for a totally new experience in flying. The masterpiece you have just created is unlike any plane you have ever flown before. Even with all control movements cut to a minimum, low speed handling is extremely positive, and rock steady. The original is light at seven lb. total, and will continue a vertical climb for some time after the power is cut. Believe it or not, the original model flew right off the board with only the slightest amount of elevator trim needed on the transmitter.